Some themes are simply way too clichÃ© and overdone. These include the Egyptians and luck or Irish themed slots. Where there's a will there's a way and they'll keep right on coming so I've never shied away from clichÃ© especially when it comes to gambling. After all, I've had some of my greatest wins on these types of games. This week I spent some time at Bingo Anywhere. I went to the bingo rooms first but all the games had already started so I scanned the slots section. The slots are categorized and under 'Free Spins' I spotted Lucky Clover, which I had not played in a long time, and thought that's it! Lucky Clover is expensive to play though. The minimum bet is £1.25. I was a little uneasy with not being able to start at a lower wager but I got off to a slow start with little wins here and there. 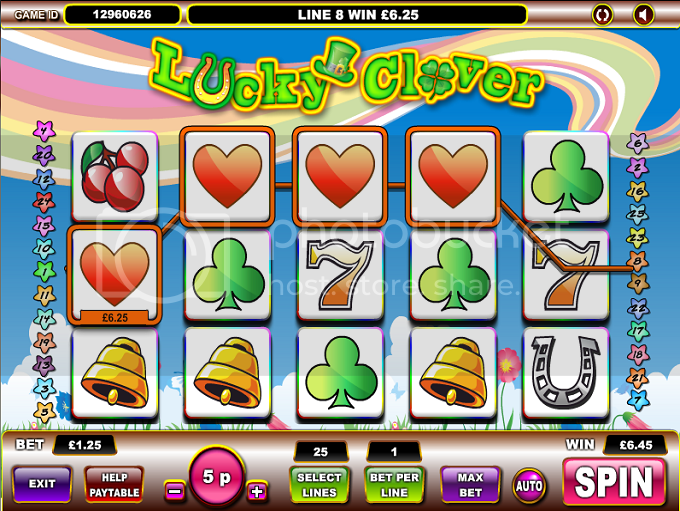 Suddenly, I hit 4 heart symbols for £6.25 followed by several winning combinations including wilds for £5.25. Even with frequent wins I couldn't quite build up my balance. When I thought about it later, the wins I had were pretty pathetic. Seriously, I was kidding myself thinking that £5 or £6 was good. Then I laughed at how quickly I lost all my bingo bucks. I had a good time risk free. How could I complain?